As a result of a political deadlock stemming from the June 2015 parliamentary elections in Turkey, President Recep Tayyip Erdogan has called a snap election, set for November 1, 2015. Even before the current political stalemate, Turks were split on whether the democratic system in their country was working, and positive views of Erdogan were at their lowest point since 2012. However, a majority of Turks still prefer a democratic form of government rather than a leader with a strong hand to guide their country. The internal divisions that are plaguing Turkey are clearly evident in a newly released Pew Research Center poll, which was conducted April to May 2015. According to the survey, the country is split evenly down the middle in terms of the way its democracy is working – 49% are satisfied, while 49% are dissatisfied. But members of President Erdogan’s electoral coalition are significantly more satisfied with the current state of democracy. This includes Turks who are older, less educated, those who support his Justice and Development Party (AKP) and Muslims who pray more than 5 times per day. Younger, more educated Turks, followers of the opposition Republican People’s Party (CHP) and less devout Muslims are more disillusioned. In addition to their mixed views on democracy, many Turks are dissatisfied with the direction of their country. Turks name rising prices, crime and inequality as the problems they worry about most. And as far as trust in national institutions, the military is the only one that Turks say has a good influence on the country. Views of the police, national government, religious leaders and the courts are mixed, while views of the media tilt to the negative. Additionally, 52% of Turks think their children will be worse off financially in the future. With the war in Syria and Iraq intensifying on the Turkish border, 67% of Turks say that fewer refugees should be allowed into the country. And when this survey was conducted in the spring, only 36% wanted to join the anti-ISIS coalition. Since then, the Turkish government has officially joined the U.S.-led campaign. In terms of foreign relations, Turks on balance still have negative opinions of every major world power tested, including the U.S. (58% unfavorable), NATO (50%) and the European Union (49%). Still, a majority in Turkey (55%) favor joining the EU, a figure that has not changed much in the last five years. And 54% say that Turkey should be more respected around the world than it currently is. These are among the main findings of a recent Pew Research Center survey conducted April 5 to May 15, 2015 among 947 respondents in Turkey. The survey was conducted via face-to-face interviews before the June parliamentary elections and ensuing political stalemate, as well as before the recent escalation in military operations on the border against both Islamic State and Kurdish PKK militants, and the suicide bombing in Ankara just this past week. Turks are generally dissatisfied with the state of their country. Just over half (54%) are dissatisfied with the way things are going in Turkey, while 44% are satisfied. Dissatisfaction has grown since 2013, when 48% were unhappy with the state of the nation. However, it is important to note that from 2002 to 2010, Turks were generally distressed about their country’s direction. Only in recent years have opinions become somewhat more optimistic. Views about the country’s direction are sharply divided along partisan lines. Almost eight-in-ten (79%) supporters of Erdogan’s AKP are satisfied with the current direction of the country, while only 22% among the largest opposition CHP agree. Other parties which did well in the recent parliamentary election, including the Nationalist Movement Party (MHP) and People’s Democratic Party (HDP), a Kurdish political party, did not have a large enough number of supporters in the sample to analyze. There are also divisions on country direction by age, education level and devoutness. Older and more educated Turks, as well as Turkish Muslims who pray 5 times per day or more, are happier with the direction of their country than younger, less educated and less devout Turks. Generally, most Turks agree that children will be worse off than their parents financially when they grow up (52%), versus the 40% who say children will be better off. And in contrast to most other countries surveyed, the young are less hopeful about their future. Only 34% of 18 to 29 year-olds in Turkey say the next generation will be in a better position financially compared with 56% of those Turks ages 50 and older. Among the issues tested, rising prices, crime and the gap between rich and poor are seen as the biggest problems in Turkey. Lack of employment opportunities (51% saying it is a very big problem) is also seen as a major issue. There are lower levels of concern over corruption among political leaders, poor-quality schools, traffic and health care. But overall, most Turks still see these issues as at least moderately big problems. Turks with less education (less than secondary education equivalent) are more concerned about each of the 8 problems tested compared with their more educated (secondary education or more) counterparts. And generally, older Turks (50+ years-old) are more concerned about each of these issues compared with the country’s youth (18 to 29 year-olds). Positive sentiment towards President Erdogan has declined significantly in the past year. Before the first round of parliamentary elections in June, only 39% of Turks had a favorable view of Erdogan. About half (51%) held a negative view of the former prime minister and de facto ruler of the country. That compares with last year when 51% of Turks had a positive view of Erdogan and in 2013 when he had 62% support. Erdogan’s supporters include AKP followers (87% favorable), Turks ages 50 and older (54%), lower educated Turks (53%) and Muslim Turks who pray 5 times per day or more (71%). The only national institution asked about in the survey that has a positive rating from Turks is the military. About half (52%) of the public say that the military is having a good influence on the way things are going in Turkey, while 37% say it is having a bad influence. Turks are divided on many of the other major institutions in their country. Nearly equal numbers say that the police, national government and religious leaders are either a good or bad influence. About four-in-ten (41%) say that the court system has a good effect on the nation, but 48% rate its influence as bad. More Turks say that the media, such as television, radio, newspapers or magazines, is a negative influence. About half (51%) say this, while 38% believe the media is a good influence. Older Turks, those with less education, those who associate with the AKP and Muslims who pray more often are more likely to hold positive views of every institution listed. In other words, those who are more likely to be a part of Erdogan’s coalition are also more likely to say that these national institutions have a good influence on Turkey. Most Turks still believe that a democratic form of government is the best way to solve their country’s problems. However, a growing minority (36%) say that Turkey should rely on a leader with a strong hand to improve their lives. 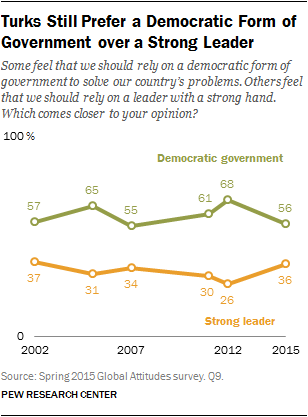 In 2012, only 26% said this, while 68% preferred a democratic form of government when given this choice. Turkish Muslims who hardly ever pray are much more likely to prefer a democratic form of government (78%) compared with those who pray five times per day or more (44%). Additionally, a solid majority (61%) of AKP sympathizers support a strong leader versus a democratic form of government (36%). CHP supporters have almost exactly the opposite opinion; 68% prefer democracy, while 27% prefer a strong leader. The country is evenly divided on how the current democratic system is working in Turkey. Roughly half (49%) are satisfied with the way democracy is working, with an equal 49% saying they are dissatisfied. But almost twice as many people are not at all satisfied with the current state of Turkish democracy (27%) compared with the 14% who are very satisfied. As with many other aspects of Turkish public opinion, there is a clear divide on this issue among different demographic groups. Older Turks, those with less education and those who support the AKP are more likely to be satisfied with the current state of democracy. Additionally, among Turkish Muslims, 72% of those who pray five times per day or more are happy with the current state of Turkish democracy, compared to 34% among those who hardly ever pray. People in Turkey think that their country should garner more respect around the world than it currently does. In all, 54% of Turks say they deserve more respect compared with the 36% who think Turkey is as respected as it should be. Supporter of Erdogan’s AKP party are much more likely to say that Turkey is as respected around the world as it should be (53%) compared with followers of the opposition CHP (25%). Despite low ratings for the EU (just one-third of Turks have a favorable view of the institution), a majority in Turkey (55%) want to become a member while only 32% oppose joining the EU. This sentiment has held relatively steady in recent years, although in 2005, more in Turkey (68%) wanted to join the European project. Meanwhile, sentiment towards other world powers is especially negative among Turks. Only 29% have a favorable view of the U.S. and just 23% have a positive opinion of NATO. Faring even worse are China (18% favorable), Iran (17%) and Russia (15%). Turks are hesitant to live up to their Article 5 obligation to come to the aid of another NATO country if it is attacked. Nearly half (47%) say Turkey should not use military force to defend a NATO ally if Russia got into a serious military conflict with that country. In this regard, views in Turkey are similar to the 8 other NATO members polled, including the U.S., Canada and 6 EU nations. In those countries, a median of 42% said their country should not use military action if Russia attacks a fellow NATO member. On the other side, only 29% of Turks say they should use force to defend their ally, with around a quarter undecided (23%). Because of the relatively high number of undecided people in Turkey on this question, the percentage saying that they should defend a NATO ally is much lower than the 8 country NATO median (48%). Turks are split on whether the U.S. would come to that NATO country’s aid. Four-in-ten in Turkey say that the U.S. would use military force to defend their NATO ally, while 34% say the U.S. would not and a quarter are undecided. (For more on NATO countries’ views toward Russia and using military force to defend a NATO ally, see NATO Publics Blame Russia for Ukrainian Crisis, but Reluctant to Provide Military Aid, released June 10, 2015). With refugees continuing to stream into Europe, Turks are insistent that fewer of them should be crossing their borders. Two-thirds say that Turkey should allow fewer refugees from Syria and Iraq into their country. Only 8% are willing to accept more refugees, while 13% would like to keep the flow about the same as it is now. Among Muslims, those who are less devout are much more likely to want fewer refugees into the country (82%) compared with the most devout Turkish Muslims (59%). Still, all segments of Turkish society say that Turkey should allow fewer refugees into their southern borders. Meanwhile, in the fight against ISIS, only 36% of Turks wanted to join the anti-Islamic State international coalition led by the U.S. when this survey was fielded. More (44%) thought they should not join the coalition, although many (20%) did not offer an opinion. However, at the time, 48% supported the U.S. military actions against ISIS in Syria and Iraq, with only 30% opposed.